Utilities are an obvious area to focus on when developing a strategy to reduce your practice carbon footprint, and there are often 'quick-wins' to be achieved. 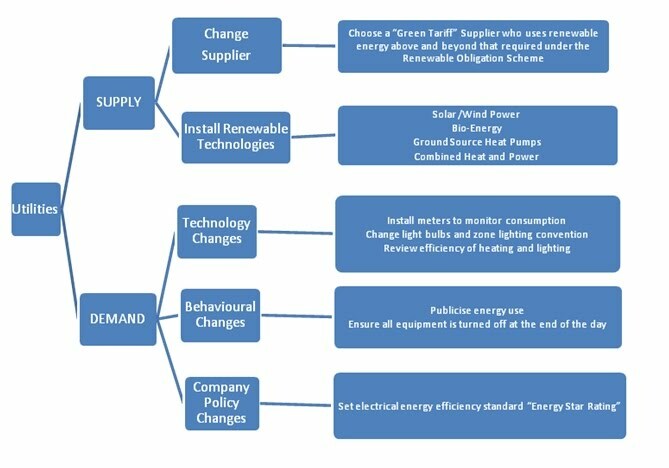 Best Foot Forward recommends focusing on demand side measures such as energy efficiency measures first before considering supply side options, through initiatives such as “green tariff” purchasing or small scale renewable energy generation (e.g. solar panels). Supply side initiatives are discussed on the renewables page. The diagram below sets out some of the options you could choose to investigate. Demand side energy management focuses on reducing your need for energy. A range of low or zero capital cost opportunities are generally available in a typical office or practice. Ensure timers are correctly set on heating and ventilation as appropriate for the occupancy of the building. Consider the optimal temperature for heating. As a rule of thumb, every degree you turn down your heating saves 10% of your heating energy. Install lighting controls so that external lights only switch on when its dark and use motion sensors to avoid unnecessary lighting. Optimising the operation of you boiler can deliver huge energy savings, view this advice from the Carbon Trust to investigate further. Monitoring power usage is an important tool in reducing energy consumption, as it raises awareness of key areas of consumption and so encourages energy efficiency. Energy consumption for major areas of the premises should be monitored on an ongoing basis. Energy suppliers frequently make electricity monitors available to their customers for free, contact yours to enquire.